The control of gene expression in skeletal muscle has been an area of active research for many years. MicroRNAs (miRNAs) are a class of short, noncoding RNA molecules that bind to mRNA molecules and play a central role in regulating gene expression through posttranscriptional gene silencing (reviewed in Bushati and Cohen 2007). Reactive oxygen species (ROS) and reactive nitrogen species (RNS) are sometimes collectively referred to as reactive oxygen and nitrogen species (RONS). RONS, and particularly the highly reactive hydroxyl radical, can react with many molecules in cells, including DNA, proteins, and lipids. 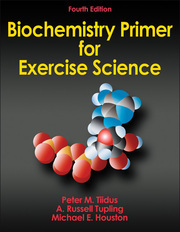 Biochemistry Primer for Exercise Science, Fourth Edition, presents an introduction to biochemistry that gives readers insight into the molecular aspects of physical activity. The fourth edition features updated research and new information on signaling pathways and the regulation of gene expression. Students trained in traditional exercise physiology have learned the basic concepts of energy but often don’t fully understand human energy consumption at the molecular level. Biochemistry Primer for Exercise Science, Fourth Edition, provides an introduction to biochemistry that will give readers greater insight into the molecular aspects of human physical activity. Biochemistry Primer for Exercise Science, Fourth Edition, combines information from nutrition, physiology, and biochemistry to provide a clear explanation of the working of metabolism and the human body’s response to physical activity. Special elements throughout the text help to demystify this complex and dynamic field of study. Key points reinforce essential concepts and aid readers in relating them to sport and exercise. Chapter summaries outline important information to take away, and review questions with answers allow readers to test their knowledge of each chapter’s content. A comprehensive glossary and the list of abbreviations found on the inside front and back covers help readers become familiar with commonly used biochemistry terms, and a reference list provides a starting point for exploring areas of interest in more detail. With its combination of essential topics, new findings, and future directions in research, Biochemistry Primer for Exercise Science, Fourth Edition, is a perfect resource for anyone looking to build an understanding of exercise biochemistry. Both students and professionals alike will find the information they need to begin their exploration of this fascinating field of study. A supplementary course text for upper-undergraduate and graduate students in exercise physiology, exercise biochemistry, and sport nutrition; a reference for professionals in those fields. Peter M. Tiidus, PhD, is a professor and former chair of the department of kinesiology and physical education at Wilfrid Laurier University in Waterloo, Ontario, Canada. For more than 30 years, he has focused his research on the physiological mechanisms of and practical interventions in muscle damage and repair, employing both animal models and human subjects. Tiidus has authored more than 80 publications and presented his research in multiple lectures and conference presentations on estrogen and muscle damage, inflammation, and repair and the influence of treatment interventions on muscle recovery from damage and physiological responses. He currently serves as an editorial board member for Medicine & Science in Sports & Exercise. He is also a former member of the board of directors of the Canadian Society for Exercise Physiology. A. Russell Tupling, PhD, is an associate professor in the department of kinesiology at the University of Waterloo in Ontario, Canada. His research program, which is funded by the Natural Sciences and Engineering Research Council of Canada and the Canadian Institutes of Health Research, is dedicated to the understanding of the regulation of sarcoplasmic reticulum (SR) function in muscle and understanding how defects in the function of SR proteins that occur with oxidative stress contribute to fatigue, weakness, and disease. In 2009, he received an Early Research Award from the Government of Ontario to conduct research examining a potential link between Ca2+ pump energetics in muscle and metabolic disorders. Tupling has 49 peer-reviewed publications in scholarly journals and over 70 conference abstracts based on his research. In 2010, he won the Award of Excellence in Graduate Supervision, which was established by the University of Waterloo in recognition of exemplary faculty members who have demonstrated excellence in graduate student supervision. Tupling is a member of the American Physiological Society and the Canadian Society for Exercise Physiology (CSEP). He was invited to give the inaugural Mike Houston Tutorial Lecture in Skeletal Muscle at the CSEP conference in 2009. Michael E. Houston, PhD, received his undergraduate training in biochemistry from the University of Toronto and his PhD in biochemistry from the University of Waterloo. A superb athlete and lifelong exercise fanatic, he was able to integrate his training in biochemistry with his love of exercise sciences and to forge a career as a teacher and scientist in the field of kinesiology. For almost 40 years during his career, he authored more than 100 refereed publications and taught courses on the biochemistry of exercise to many undergraduate and graduate students. In 2003, he was presented with the Honour Award from the Canadian Society for Exercise Physiology in acknowledgment of his lifetime contribution to research and education in exercise science. Houston was the author of the first three editions of Biochemistry Primer for Exercise Science. This fourth edition, which is built on his body of work, still incorporates a major portion of his third edition. Dr. Houston passed away in 2008.